Every year near the middle of October, a special day is celebrated around the world thanks to a delegation of Hungarians 39 years ago. You might never have known about it or heard of it, but World Food Day is commemorated annually on October 16th in over 150 countries. Its purpose is to raise awareness about the issues behind poverty and hunger. On October 16th and 17th, Miskolc University is also going to take part in this important event. There is a group of students and teachers on our campus who are members of an organization called Universities Fighting World Hunger (Egyetemek Harca az Éhezés Ellen). UFWH started in 2004 at the University of Auburn in the USA in partnership with the United Nations’ World Food Programme and has activities on almost 300 university campuses around the world. The founding goal of UFWH is to develop and put in place an action agenda for students and faculty that leads to a university community that is fully engaged in the effort to eliminate hunger. Miskolc University’s UFWH team partners with the Hungarian Red Cross of Borsod-Abaúj-Zemplén County to help people in our local area who are hungry and need assistance. On October 16th and 17th from 9 AM to 2 PM, volunteers will be collecting long-term foodstuffs (canned goods, pastas, etc.) at the University’s main entrance, Galéria entrance, and rácsós büfé entrance. You do not have to donate something large, because every little bit helps. The food that is given has to have a minimum expiration date of three months. The local Hungarian Red Cross will make sure that the donated items are distributed to people who need them. 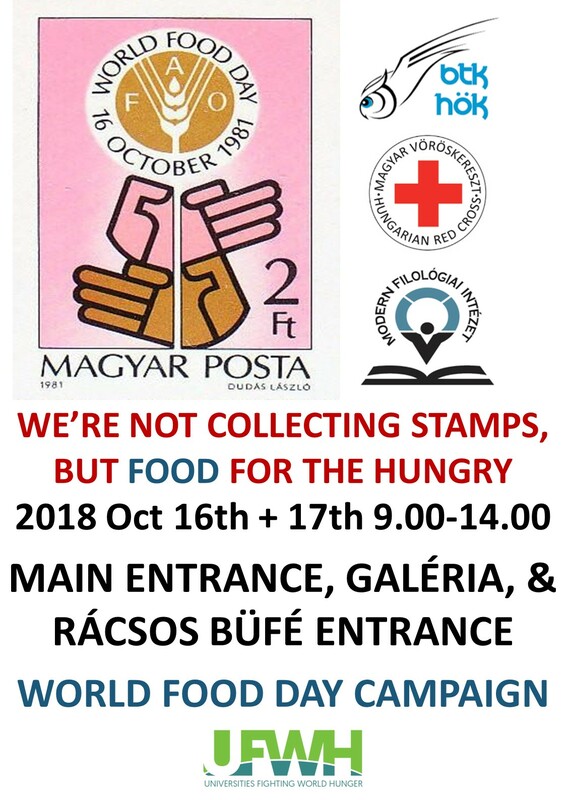 So what, exactly, is the Hungarian connection to World Food Day? 16 October was proclaimed to be World Food Day in 1979 by the Food and Agriculture Organization of the United Nations (FAO), as this day marks the date of the creation of the FAO in 1945. At the 1979 conference where this proclamation was made, the Hungarian Delegation (led by the former Hungarian Minister of Agriculture and Food Dr. Pál Romány) came up with the idea of celebrating World Food Day across the whole world, and then this idea spread. So there you have it! A day that is observed in many countries across the world thanks in part to the initiative of some Hungarians 39 years ago. Let’s keep this spirit alive and have World Food Day make a great impact on our community by holding a fruitful collection at the University of Miskolc on October 16th and 17th!